This German Hummel 15 cm schwere Panzerhaubitze auf Geschützwagen IV (Sf.) self propelled artillery gun (Sd.Kfz.165) can be seen in the US Army Artillery Museum, Fort Sill, Oklahoma, USA. This is another late production Hummel. The US Army Artillery Museum is based in Fort Sill, Oklahoma, USA. You will find it on Corral Rd. It is south west of Oklahoma City and an a 80 minute car ride from that city centre. It is just north of Lawton. The main gun was a 150mm sFH 18/1 L/30 artillery Howitzer. The high explosive shell was in two pieces. It was a ‘separate loading’ or two part round. First, the projectile would be loaded and then the cartridge propellant case. Due to the large size of the high explosive shells and the seperate propellant cartridges only 18 rounds could be carried. The crew also had access to a 7.92 mm MG 34 machinegun. It had a six man crew and they were protected by armour that ranged in thickness from 10 mm to 30mm. The gun was fixed to a panzer IV tank chassis. It was powered by a Maybach HL 120 TRM V-12 Petrol engine that produced 296 hp. It had a top road speed of 42 km/h (26 mph) and an operational range of around 215 km (133 miles) before the crew needed to refule the vehicle. Fort Sill Field Artillery Museum, Oklahoma, USA 150mm Howitzer (Bumble Bee) Hummel. 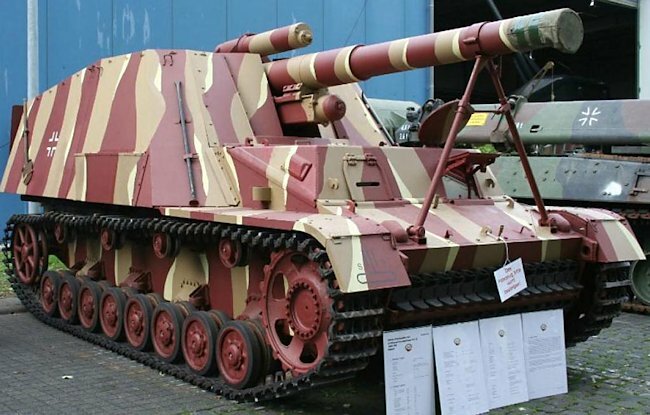 Over 650 German 150mm Howitzer (Bumble Bee) Hummel self-propelled artillery guns were built beginning in 1942. 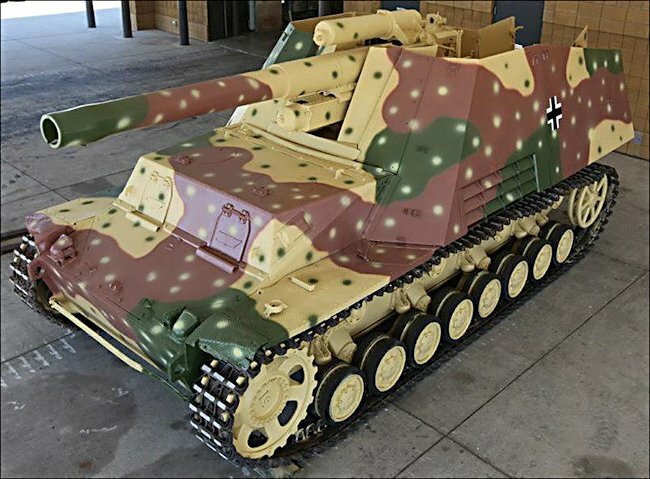 This Hummel was acquired from the Armor Museum at Fort Benning, Georgia in April 2012. 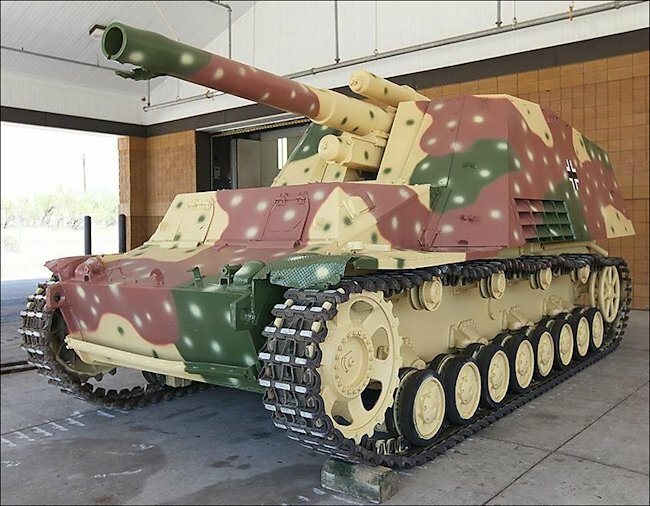 It has been restored by the Metal and Paint Shops of the Directorate of Logistics (DOL) and painted in this ambush scheme which was used on German fighting vehicles in 1944. The opposite color dots on the basic three color camouflage simulated the appearance of sunlight filtering through the trees under which the vehicles were waiting in ambush. 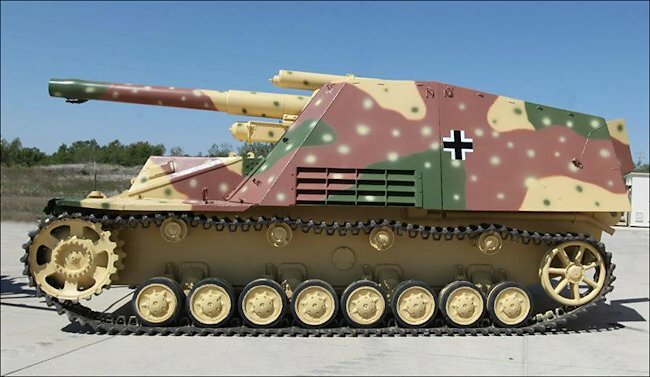 A late production German Hummel self propelled artillery gun can be identified by the full body width raised drivers compartment. Where can I find other preserved Hummel self propelled guns?